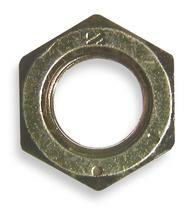 ASTM A563, 194, commonly known as finished hex nuts grade 8 for use with grade 8 - Maintenance Products Inc.
ASTM A563,194, commonly known as finished hex nuts grade 8 for use with grades 8 or less stock. Yellow dura plated for extra added protection. Also available in bulk quantities and plain finish.